Another of the innovative ideas dreamt up and orchestrated by the chef are les mardis de la créativité: on Tuesday evenings (only) he concocts two menus, one with three courses (€47) and one with five (€68). They’re a sort of culinary dress rehearsal where he tries out new dishes which (if successful), will move onto the main menu. I love being a guinea pig and had tried several times to book a Tuesday dinner but always failed – they’re as popular with locals as with passers-by/through. Alsace has always been a lieu de passage and Frankenbourg makes a good stopping-off point for folks heading south from the UK, Holland or Belgium, or north from Italy, so you need to plan ahead to avoid disappointment. This week we finally got our act together and paid a visit. We opt for 3 courses of creativity with wine pairings, then sit back to enjoy the anticipatory moment (one of the best bits of a meal), as well as the acoustics (excellent, in spite of the high roof and lack of curtains), the gentle buzz of conversation (happy families of all ages, a gourmet group of women, a foursome of happy eaters, a couple of birthday-celebrators) and the smiley staff. Duck foie gras sports a few swirls of parsnip (a happy combo, which takes me back to a New Year’s Eve feast for two of pan-fried foie with pureed parsnip), crunchy bits of caramelised walnuts and soft blobs of slightly salted white chocolate. (The alternative, which might have been bolder but sounds less tempting, is a soup based around roasted buckwheat, strips of cuttlefish, cumin oil, mushrooms and a potato bouillon.) The elected wine is a fragrant, off-dry Pinot Gris from François Schwach. For mains we go our separate ways – rabbit versus veal shin – both deeply delicious and each offering that essential counterpoint of crunch. For the fork-tender, boned and stuffed rabbit reposing on a puddle of bright orange potimarron and quince, there are ceps and petals of red onion. The lacquered veal shin comes with spirals of confit-ed leeks on a potato base with a scattering of crusty bits of sweetbread, the whole accented by a sternly reduce jus and herby vinaigrette. 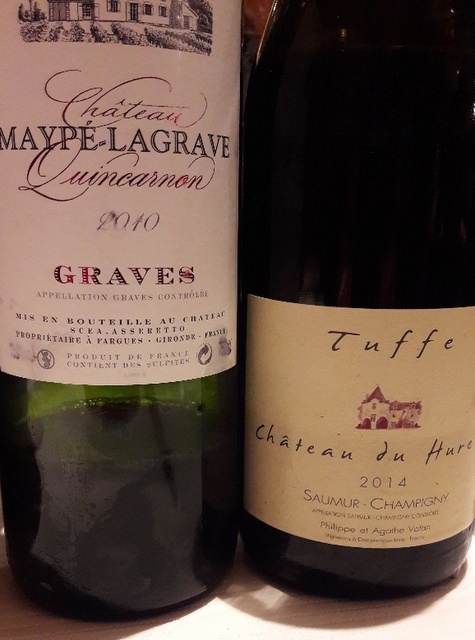 My allotted glass of Tuffe Saumur-Champigny (Chateau du Hureau) comes up trumps with the rabbit – I love Loire reds and Cab Franc is a happy match for white meat: fresh with peppery (capsicum, not piper) flavours, neither heavy nor meaty with nice acidity. The veal owner (though he lends me a bit to taste – we’re good at sharing) gets a glass of Maypé Lagrave (Château Quincarnon, Graves), a light and pleasing claret. Both are on the (extensive, interesting) wine list at €39 and €37 respectively. The cheese trolley, a magnificent wooden contraption the size of a carpenter’s bench and groaning with sundry temptations, hoves into view. Models of restraint, we decide to share a plate (and to hell with the €14 supplement and our livers) – worth it for the chunk of Laguiole from the Plateau d’Aubrac, a ripe goat from the Loire, a proper piece of raw-milk Camembert which looks set to slither over the edge of the trolley (so we come to its rescue) and the indispensable Munster, Alsace’s only serious (i.e. AOP) cheese, made and aged to stinky perfection just up the road from the restaurant. Bread comes in the shape of a small personal loaf cut in wedgy pieces, with salty butter on the side. We go our separate ways again with pudding. One, billed as a mousse légère à la cacahouète, sablé breton au cacao, sorbet chocolat et mousse épicée, combines rich/sweet/salty (peanut mousse), smooth (chocolate sorbet) and crunch (sablé). I lose my nerve on that one, fearing it might sink me after foie gras & Co, and opt instead for the pear dessert. This, having rather undersold itself simply as une poire au caramel, turns out to be a wisp of a caramel mousse with fragrant pieces of poached pear (Williams? ), corseted by a crisp chocolate pastry and topped with smooth-as-silk pear sorbet (wish I could make those beautiful quenelle shapes…). So how did the chef stack up on the creativity front? 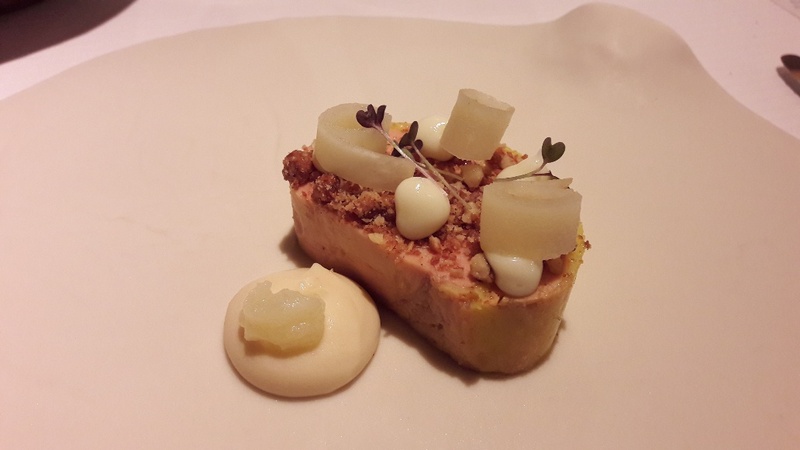 I gave good marks for the foie gras, whose usual bland unctuousness was offset by the crunch of caramelised nuts and parsnip swirls, but wasn’t convinced by the white chocolate blobs. The veal shin, its skin lacquered like Peking Duck, was wicked: I loved the sharply contrasting vinaigrette and the crusty bits of sweetbread (I like a bit of crunch), and I can’t wait to try doing leeks the way the chef did them, sliced, up-ended, slathered in butter, gently cooked and sitting on a base of pommes boulangère. I often go for rabbit on a menu as I never prepare it at home (too fiddly, often too dry) and this almost nailed it: pretty as a pic and a lovely mix of textures and flavours – if it hadn’t been served rather too cool it would have got 9/10. Of the two puds, the chocolate creation with its unlikely peanut mousse won the day (and – together with the foie gras – has already passed Go and graduated to the autumn menu). The pear/caramel concoction was clever and good-looking but a little piano. The icing on the cake was the service which mixed attentive/professional with relaxed/smiling in just the right measure. I’m betting it won’t be another 10 years till we find our way back to the Frankenbourg. Previous: Previous post: Who was Le Corbusier?